Inspired by the great Belgian brewing tradition of Trappist monks established over the centuries, Unibroue 17 was first brewed in 2007 to celebrate our brewery’s 17th anniversary. However, the overwhelming success of this specialty brew made it obvious that we could not let such a great ale slip into the anonymity of retirement. As testimony to its remarkable flair profile which increases in complexity as it ages, the original batch bottled in 2007 was awarded an international platinum medal three years in a row, and the prestigious title of "World’s Best Dark Ale" when it was well past three years in the bottle! So in 2011, we proudly brought back this French Oak aged, bottle refermented dark ale, with the "Grande Réserve" appellation as a fitting endorsement of it’s exceptional quality for aging. Brewed only once a year, in limited quantities, and individually numbered "brasseur" bottles, this is truly a flavorful delight for the specialty beer enthusiast. UPDATED: APR 19, 2019 I got to taste a small sample of this while volunteering for a beer tasting festival. Dark brown appearance. Flavors of caramel & chocolate malts, toffee, mild fruit, oak, etc. Pretty complex yet balanced pretty well and not overly sweet. Still...a heavy beer and you can feel the ABV%. UPDATED: FEB 7, 2019 Thought 17 had been sampled and rated previously. Not so, actually good news since Belgian ales are a particular favorite. The 750 ml caged and corked bottle sports the note 'bb 06/12/21'. So, yes, I will be beating that date considerably. I elect to use my Chimay glass for this brew, it pours a dark brown, black, amber liquid, a bit of all with a glorious straw-tan, finely bubbled head. The scent is swell, plums, raisins, yeast, you get the idea. The payoff, a drink, a firm maltiness initially followed by dark fruit, bread dough, nectarine. Mildly spicy with an acknowledged bitterness. Just the barest hint of sweetness. The head contributes some creaminess. Very nice. UPDATED: DEC 1, 2018 12/1/18 (Chicago): Bottle purchased in 2013, best before 2/28/18 on bottle, poured into Chimay chalice. Dark ruby pour, generous puffy off-white head leaves generous lacing as it slowly dissipates. Very nice sweet aroma, spices and fruits. This beer aged very well. Roasted malt, raisins, figs, cherry taste. The whole fruit basket, very well blended, slighly spices offsets well. Extremely mellow and smooth creamy mouth feel, carbonation holds well. Excellent beer, one of my all time favorites, well done once again Unibroue!!! UPDATED: NOV 16, 2018 How to start! I love this beer! probably had it 50 times so far, prefered around winter to really apreciate the heat that it pack with it 10%abv. I wont talk much about the taste because they are alot of good info on that elsewere, instead i will describe the evolution of the 17. I'm much familiar with this beer aging developement, still having 2011-15 ones in the cellar, i can say some years has been better. The best one to me was the 2011 and that. every years in the cellar that one was still the winner! the 2012-2016 was great but had a bit too much of fruits acidity, that took years to mellow out to reach a good balance, some prefer it but i found that it overpower the other amazing subtle notes in that beer, leaving too much bubblegum taste. But yesterday while trying the new ones(2017) i was blown away by how spot on it was! The carbonatation was right! not too much for once, the taste of ripe fruits was there but so mellow and perfectly paired with the french oak end! 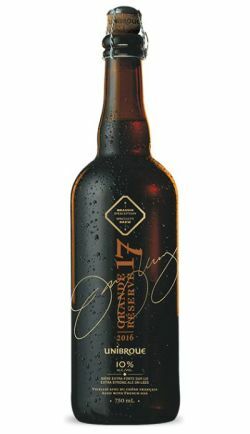 The 2017 unibroue 17 will definitly be my official 2018 christmas beer! And at the price point of 9.99cad for a 750ml thats a bargain! Go get some before i buy them all! Cheers! Pours dark brown with a medium, off white head. Aroma is dried fruits, wood and some caramel. Taste is plum and toffee, warming to wood, clove and some cinnamon. Finish is malt and Belgian yeast. A very good beer. 750ml bottle shared with George and wife. Vintage 2015, BB 2020-09-24. Pours a very dark hazy brown with a tan head. Aroma is dark fruits and barrel. Taste is similar, quite harsh. Ok.
2011 bottle in Seattle, at the Click holiday party. Creamy head, dark brown with red highlights. Boozy rum, cognac, brandy impressions on nose. This bottle has held up very well. Rich and leathery with well balanced sweetness. Very, very nice. Tasting @ Tim's. Original batch from 2007, 10 years old by now. Pours copper, light clouds, good beige head there, decent carbonation. Vinious caramel nose, dark dried fruits, light berry juice and a bit of liquorice. Cherry candy. Taste has soft caramel, really blended together nicely, warming, dried fruits, candy sugar. Oak and ash coming out more in the end. Time has really contributed to this, well blended together. Finish has a touch of bitterness, good linger that has some dry oak and also a light alcohol bite. Very Belgian but in a good way. Thanks Tim, this one is a very special treat. Bière d’un brun opaque et profond, avec une belle mousse beige. Nez ou le caramel et les fruits sont en évidence. En bouche, c’est une super explosion de sucre brun et de sucre d’orge, j’adore. Différent des autres produits Unibroue, ce qui est vraiment bien!!!! Cheers !